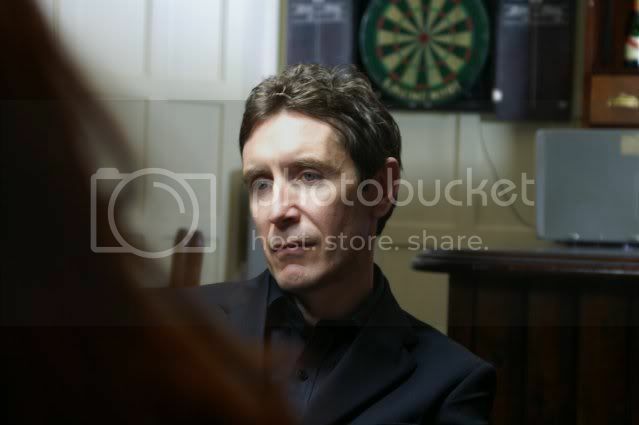 A few posts ago I promised to write more about the work of Paul McGann on this film, and tonight as I came across the rough edit we did in Burbank in late 2006, now seemed appropriate. As this blog progresses I will write many more positive things about almost all the actors on this project. This is not to falsely praise them, nor is it simply a nod to shared experience or trauma survived. It's because for the most part we were very lucky with the people we were privileged to work with. They were generous, patient, and above all talented. But a special place is reserved for me with Mr Paul McGann. In mid 2006, it became obvious that the film required another viewpoint apart from that of Steve Lynch. Partly this was from convenience (the story became too complicated to have one character constantly re-explain it) and also from an attempt to place the story on two separate days, so that we weren't confined to only shooting in the bright summer. So a storyteller device was added: the story of Steve Lynch would now be told in the past tense to a complete outsider by the intimately involved character of Roy Weggerly (Mark Rathbone). The outsider was a 'Mr Johnson', a gangster acquaintance of Roy's. Thea MacLeod, our star casting agent, suggested a gallery of excellent suspects for this part, which Jeremy Henman and I had barely conceived, let alone written. One name stood out, half way down the list. 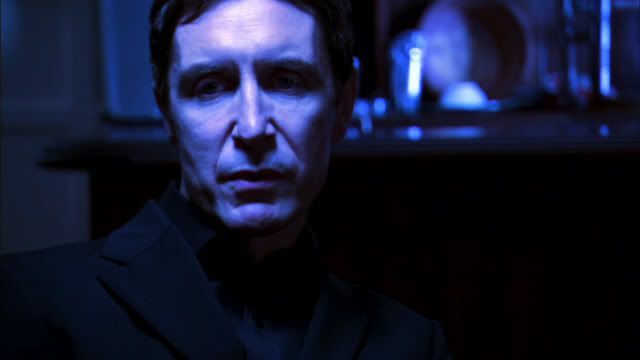 "Paul McGann? Really? He'd be up for this?" "Um, because we haven't written any of it yet?" "Well, I need something to send out by tomorrow. Morning." It came to some 12 pages or so. Early drafts are always overwritten. You have no idea yet which bits are important, so you throw it all in. But it covered everything we thought we needed. It framed Steve Lynch's story as essentially Roy's confession - the final tale of a man's fallen dignity laid bare, with Mr Johnson as the angel of death. But it was still a hell of a mess. We were nervous. While we all were aware of his work, we definitely weren't die hard fans, but somehow the idea of him doing this part came to obsess us. It became the first question asked every day - have we heard from Paul? Do you think he'll do it? We didn't care about anyone else - this was our guy. Now time was playing a part - we'd organised everything for a Saturday in early November. If we didn't have an answer by Wednesday we'd have to scrap the shoot until deep into 2007. Wednesday at about 5pm I got a call from a mobile with a familiar voice on the other end. "He's sort of like a priest really." "I see it as very still. He barely moves." "Like a visit from the angel of death." "It's very long. I may not have it all by Saturday. I'm travelling." "That's ok. We'll roll with it." "OK. See you then. Shall I wear black?" Saturday upstairs in a pub off Waterloo Bridge. No dressing room, no green room. The usual din of a busy set in a very confined space. Paul sat dressed ready to go, and said very little. The first section of the scene was 6 pages. He had to do a complicated entry, deliver a speech in three distinct parts standing, then sit, and deliver another speech in almost five different parts. Throughout he has almost no other actors to play off. He has every line. The scene was lit in a way that required him to hit several marks at the same time, otherwise he would be in complete darkness. He had to pour himself a drink, and remember to keep savouring it. I was petrified at how long it would take to get. "Right Paul, shall we give it a go?" He smiled and went to his starting position. We rolled. About 30 seconds in, it was like I had an out of body experience. Andre de Souza was DOP that day, and snuck a look at me off the eyepiece of his camera. It was mesmerising. Its not unusual for actors to be word perfect quickly - that is their job. But this was more. This was every nuance correct, every pause perfect, and all encased in a phenomenal stillness that seemed to warp the gravity in the room. He was genuinely a different person now. People sometimes ask if its rewarding to see a character or a particular passage of script come to life. The answer is yes, but its incredibly rare to actually see it. But here it was, a scene unfolding as if every word and movement was naturally occurring to him for the very first time. This was "Mr Johnson" in the flesh, a real, living being that you could feel and touch. He reached the end. No-one said or did anything. We were all hypnotised. Our First, Peter Errington, finally called "Cut" from downstairs. Paul relaxed, then turned back over his shoulder to me. I saw this recently and tried to contact them but haven't received a reply as yet - will let you know if i do. Oh! I've got to see this! Surely, there must be a DVD, please God! That's a wonderful post by the film's director. It's an amazing insight into Paul's talent, experience and professionalism. Hopefully Mr. Johnson's deleted scenes will be in the DVD.